There were diversions. 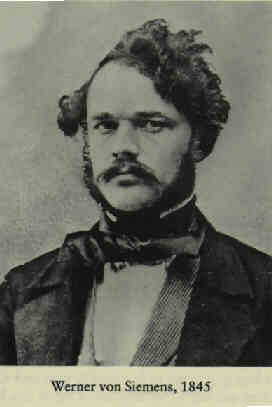 In 1857, Werner invented the pneumatic tube system. At the same time, Wilhelm was coordinating with Friedrich in the development of a regenerative gas condenser for steam engines. This was later modified and patented in 1856 by Friedrich, in the form of the gas regenerative furnace which was to revolutionize the steelmaking industry. 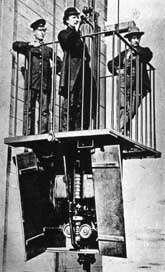 These side excursions, as important as they were, did not deter the brothers from their primary interest — electricity — and in the decades that followed, their firm became world famous for the telegraphic apparatus it manufactured and the transmissions systems it con- structed.On land, the brothers erected the first great telegraphic line on the continent, linking Berlin and Frankfort. At sea, they laid six Atlantic cables from the largest cable-laying ship of the day, built by Werner. One submarine line covered a distance of 3000 miles. (c) 2009 Elevator World. Design by Brett Mouron.